The ground-based detachment took place between 23 August to 12 September 2017 at the Sam Nujoma Marine and Coastal Resources Research Centre (SANUMARC) of the University of Namibia at Henties Bay (22°6’S, 14°30’E, 20 m asl). 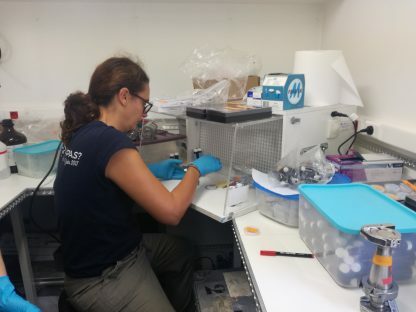 Since 2011, SANUMARC hosts the Henties Bay Aerosol Observatory (HBAO; Formenti et al., 2018), recently established as a regional GAW/WMO station and part of the AERONET global sunphotometer network. The instrumentation deployed at HBAO was in large part related to the payload of the PEGASUS (PortablE Gas and Aerosol Sampling UnitS) mobile platform. PEGASUS is a self-contained facility consisting of two standard 20-feet containers (the “observatory” and the “laboratory”), equipped with air-conditioning, rectified power, air intake and exhausts for atmospheric sampling. 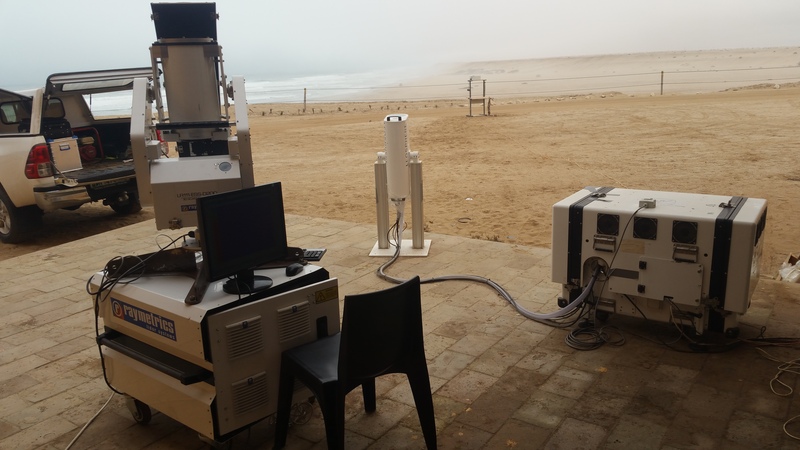 PEGASUS has high-volume aerosol inlets (isokinetic at average wind speeds from 5-10 m s‑1, typical for coastal Namibia) allowing for sampling of coarse particles. The total sampled flow rate (~400 L min‑1 per inlet) was distributed to online analyzers and to multiple- and single-stack sample collection units for off-line analysis of bulk and size-resolved chemical and mineralogical composition, soluble fraction and mixing state. Artefacts due to contamination or ageing prior analysis are reduced by preparation, conditioning and storage in the laboratory module, a grey-room equivalent equipped with standard laboratory material (laminar flow bench, water purification system, refrigerator, deep-freezer…) to increase the representativeness of the post-field analysis. The routine sampling strategy alternated daytime and nighttime collection (approximately from 0700 to 1700 UTC and 1730 to 0630 UTC, respectively), but was adapted in real-time to the nature and the aerosol load of air masses using the readings of the local wind speed and direction and aerosol concentration. Additional information on the aerosol chemical composition, including source tracers, was provided by an aerosol mass spectrometer for on-line measurements of the organic and inorganic fraction of sub-micrometer particles and a Single Particle Soot Photometer (SP2) to quantify the refractory black carbon fraction. The aerosol size distribution from 10 nm to 30 µm was measured by a combination of standard optical and electrical mobility analyzers. The aerosol optical properties were measured by a three-wavelength integrating nephelometer, a seven-wavelength aethalometer, and three single-wavelength extinction meters. Measuring simultaneously the spectral scattering, absorption and extinction is important in constraining the aerosol single scattering albedo (ratio of scattering to extinction), a critical parameter in assessing the effect of aerosols on the radiative budget. The aerosol growth factor was measured at 85% relative humidity by a custom-built Hygroscopic Tandem Differential Mobility Analyzer (HTDMA; Denjean et al., 2014), whereas two custom-built Condensation Cloud Nuclei counters (CCNC) measured, at various super-saturations, the activation into cloud droplets of total and single-size submicron aerosols. Gas phase measurements were used to characterize the chemical nature and age of air masses and to document episodic events of marine biogenic activity and biomass/fossil fuel burning. These were done by standard analyzers measuring SO2, NOx and O3 and by a high-resolution proton transfer reaction time-of-flight mass spectrometer (PTR-ToF-MS), measuring sulfur species from marine oxidation, acetonitrile to trace biomass combustions, and terpenes as biogenic secondary organic precursors among other volatile organic compounds. A meteorological station was located on the roof of PEGASUS at 10 m above ground. Additionally, a sodar measured the three-dimensional wind below the stratocumulus cloud deck and a spectral radiometer provided us with spectral down-welling irradiance in the ultraviolet to near-infrared. Additional insides of the thermo-dynamical structure of the atmosphere and wind profiles were provided by frequent launches of radiosondes, whereas the vertical distribution of the aerosol concentration in the near-surface boundary layer was probed by a miniaturized optical counter (Renard et al., 2016) onboard a tethered balloon. An instrumented station consisting of an extinctiometer and two optical counters provided with the measurement of visibility and the stratus/fog microphysics. As fog is a significant feature of this coastal environment, additional collection experiments were performed with two pre-cleaned Caltech Active Strand Cloud Water Collectors (CASCC). One Leosphere ALS lidar measured the vertical profile of aerosol backscatter and linear depolarization at 355 nm. The MPLNET lidar network provided two 532 nm linear polarized backscatter lidars, one at the PEGASUS site and another at Windpoort, southwest of the Etosha Pan. 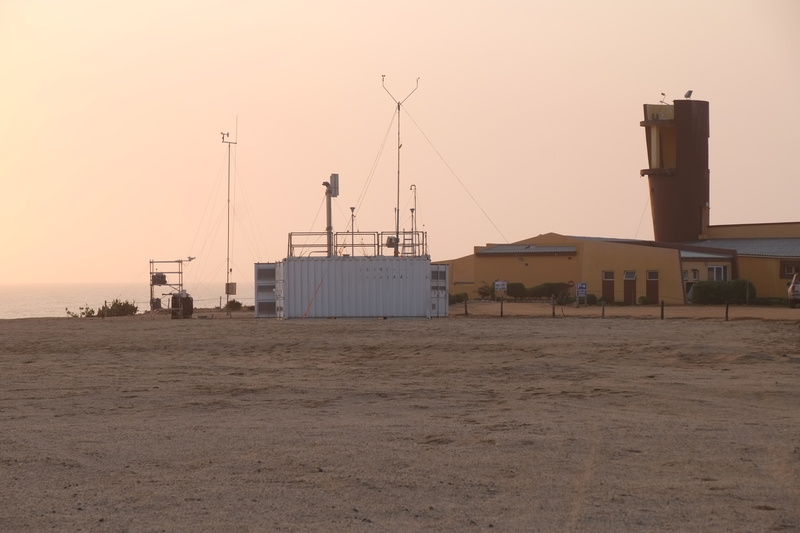 The AEROCLO-sA deployment was completed by many distributed AERONET sites in Henties Bay, Namibia and Angola (Holben et al., 2018).